A complete collection of user interface design and Enterprise Resource Planning and Schedule controls for WPF, WinForms, Silverlight and ActiveX. 100+ royalty free Appointment, Resource Gantt-style Scheduling, UI Design and Data management controls for 32 bit and 64 bit ActiveX, Silverlight, WinForms and WPF / XAML. ALL in one Great Value Product! The ultimate addition to any .NET developers toolbox: Calendar Silverlight, Calendar WPF, Solutions Schedule .NET Standard, Solutions Schedule Silverlight, Solutions Schedule WPF and Studio Controls for .NET. 24 royalty free .NET controls for Enterprise Resource Planning, Scheduling and UX design. The ultimate addition to any .NET developers toolbox: Calendar Silverlight, Calendar WPF, Solutions Schedule .NET Standard, Solutions Schedule Silverlight, Solutions Schedule WPF and Studio Controls for .NET. Enterprise Resource Planning, Production Scheduling, Outbound Service Optimisation, Logistics, Supply Chain Management, Warehouse Management Systems, and more - all are common examples of commercial software using Solutions Schedule for intuitive, interactive, snap in commercial Enterprise Resource Data presentation. Welcome to Solutions Schedule .NET version 7.0 - industry tested and developer's choice of snap-in Enterprise Resource Planning and Scheduling component software for Visual Studio .NET. The multi column List View and Tree View area - where developers define either style of presentation - the direct edit List View or the Tree View and connect data for presenting and interacting with categorised lists of Resources. The Ruler Area, which offers direct time line customisation for creating plans and schedules based on time types and time lines of Seconds to Years. List Items, which originate in the List View / Tree View area and carry through the Scheduling Area for contiguous representation of Resources and the tasks and roles assigned to them. The Time Bars, which reside in the Schedule Area that complete DBI's unique Gantt Style, intuitively interactive, Drag and Drop planning and scheduling surface. Each of the primary elements that comprise Solutions Schedule are managed dynamically by the architecture and business rules applied through the construct of the control. Further, via the Properties, Events and Methods (PEMs) developers are provided discrete programmability and full control of the control's presentation - including user (owner) drawn features built into the List / Tree View, Time Line Ruler, Time Bars and Schedule area. User Drawn features are found in the Enterprise license. Studio Controls for .NET offers developers 18 royalty-free .NET WinForm and Smart Client controls for Outlook style scheduling to snap-in reporting, Windows application navigation to modern design presentations controls for natural end user functionality. Appointment Scheduling, Time Tabling, Day Timer ... you name it ... DBI's Scheduling component software is the number one choice of Visual Studio developers. Don't settle for less - when integrating Microsoft Outlook is not an option get the number one appointment scheduling and modern Windows UI design controls - all found in Studio Controls for .NET! Calendars: Time is a sensitive issue and using the right calendar and appointment scheduling components can mean the difference of releasing on time. Create your own style, calendar and scheduling presentations quickly. General Presentation: Add Flexibility and dashboard features to your favorite IDE with the great presentation tools of Studio Controls for .NET. DBI's UI design and presentation controls allow for custom branding, interface design and ease of implementation, saving hours of development time. Gauges: dbiGauge is an ambidextrous control comprised of a gauge object, a needle object and a pin object, offering developers a range of presentation options from simple gauges to complex multi-data point presentations all in a single instance. Labels: Add a little flair to application titles and form labels. dbi Label offers developers a modern Visual Studio .NET control for elegant yet simple and straight forward enhancements. Meters: Project real-time data and progress status in a variety of digital and graphical presentations. dbiMeter accelerates data visualisation with the least amount of programming. List and Tree Views: dbiList is an integrated data List view and a hierarchical Tree view all in one control for fast direct entry and presentation of data, reporting and data navigation. At the heart of Power is Performance and Functionality. When crafting a data intensive application you want the industry proven performance of DBI's data management controls. Capable of handling millions of rows of data providing results beyond expectations. DBI's Windows Forms component software products - Studio Controls for .NET AND Solutions Schedule for .NET Standard - ALL in one product offering for a great per developer price! Nineteen (19) royalty-free WinForms controls for Enterprise resource planning, scheduling and UX design. Three Schedule Controls in ONE. Manage all of your dynamic Outlook style Schedule requirements with ease and with one control. Multi Column Day view, Month view and Week view - all in one Silverlight Control. Data Integration - DBI Calendar Silverlight is designed for data flexibility. Connect to any data source - XML to SQL to Oracle to DB2, etc. One to One, One-to-Many and Many-to-Many relationships for each of: Appointments, Contacts, Locations and Tasks. It's not uncommon for one appointment, a conference call for instance, to appear in many locations, have many contacts and have many tasks associated with that activity. Calendar Silverlight resolves schedule complexities with one holistic management solution wrapped for elegant user experiences. Solutions Schedule Silverlight - bringing Rich, Enterprise Resource Planning and Scheduling in a reusable component software format to Rich Internet Application development. Extend enterprise resource management, scheduling and optimisation functionality with the number One component software - Solutions Schedule for Silverlight. Extend your XAML development today! Solutions Schedule for Silverlight ships with an additional assembly - dbiScheduelSLDB, that provides functionality to persist the dbiScheduleSL control and its objects to XML; In either isolated storage or to a local directory. dbi Calendar WPF combines three controls; a Multi Column Day/Resource View, a Month Calendar View and a Week Calendar View, into one compact, feature rich, royalty free WPF component software product - for expertly adding schedule functionality in any WPF application. From desktop to mobile computing platforms, extend enterprise resource management, scheduling and optimisation functionality quickly and efficiently. Solutions Schedule for WPF incorporates an optimised architecture and design making the control ideally suited for the most demanding applications, handling thousands of activities, resources, constraints and reservations. Solutions Schedule for WPF is designed for every industry in which valuable resources, including people, machines and raw materials, need to be scheduled and planned. DBI Schedule WPF helps developers build the perfect front ends for desktop and Rich Internet Applications (RIA) in key areas of resource management and optimisation, production scheduling and planning including logistics scheduling and planning. Extractor is an agnostic content summarisation technology that automatically parses news, information, documents... into relevant and contextually accurate abbreviated summaries. Used by search engine optimisation (SEO) and document management companies, the Extractor summarisation technology reads a document, much like a human being does, returning lists of the keywords and key phrases accurately weighted as they are found in that document, text or web page. Ready for web services, packaged software or customised with the source code framework, Extractor is immediately capable of consuming documents of any length and subject matter, distilling the precise, contextual meaning of the target content into keyword and key phrase summary formats. Extractor's unique patented technology delivers precise content summaries in any subject domain without retraining and without human intervention. The Extractor technology uses a patented set of core algorithms to extract (read) keywords and key phrases from any text-based document. The patented process allows Extractor to maintain the context in which the subject matter has been expressed and one of the primary differences. In essence a machine learned method for reading (summarising ) any document of any subject matter written in an electronic text format. The distinction of machine learned is important in contrast to other methods of summarisation discussed, which typically use referential and / or probability based theories for trying to determine content. These contrasting approaches require that their algorithms be trained and retrained per specific subject domain (non-machine learned) and are usually only supported in English. Is an industry tested, commercial component software development product offering COM-based IDE developers 9 royalty free, modern ActiveX Windows UI presentation and scheduling controls. Included are: Calendar, Contact, Date and time Edit, Drop Date, Drop Menu, Frame host, List Bar, Tool Bar and a Tray control. The World's number one Gantt style asset management and multi resource scheduling component software for COM-based development platforms. Solutions Schedule COM 64 offers the latest in Windows styles and themes and User Interaction with full developer customisation features. he World's number one Gantt style asset management and multi resource scheduling component software for COM-based development platforms - Solutions Schedule for COM offers the latest in Windows styles and themes and User Interaction with full developer customisation features. Offering Microsoft Access, C++, VBA, Visual Basic, VFP, Delphi, LabVIEW ... developers built-in Gantt style drag and drop scheduling. Including - User Drawn Time Bars, advanced navigation, conflict management, current presentation styles and more. Solutions Schedule COM 64 is the choice of commercial Health Care solution providers, ERP and CRM product developers including process management systems providers. The Ruler Area - which offers direct time line customisation for creating plans and schedules based on time types and time lines of Seconds to Years. The Time Bars - which reside in the Schedule Area that complete DBI's unique Gantt Style, intuitively interactive, Drag and Drop planning and scheduling surface. Studio Controls COM 64 contains 19 royalty-free Unicode compliant 32 and 64 bit ActiveX / COM controls for modern Windows UI designs, data management and Scheduling. Control options include: Appointment Scheduling, Calendars, Contact Management, Data Entry, Navigation, snap-in Reporting and Data Presentation controls offering custom branded dash board capabilities. The ideal toolbox set of 64 Bit controls for 64 Bit VBA Developers. New for Studio Controls COM 64, ctxCalendar combines the best of three appointment scheduling worlds into one 32 / 64 bit ActiveX control. Load Data once and present Appointment, Contact, Location and Task detail across one, two or all three views. Create custom Rolodexes and contact management systems with ctxContact. Perfect for enhancing Corporate and Personal Information Management solutions. A great set of features provide full customisation options for Developers. At the heart of a solid application is the Power, Performance and Functionality for interacting with data. And then presenting that data with effect. Industry proven, DBI's 32 bit and 64 bit ActiveX data management controls out-perform and provide results beyond expectation. DBI's unique data presentation and reporting features offer developers flexible Unicode supported options for creating quick built-in reporting, lightening fast data entry and intuitive data presentation. Gauge and Meter controls offer a certain dexterity when it comes to presenting data for quick understanding of what data is saying and at the same time making what can be complex information pleasingly palatable. Data Input and being able to edit data is eventually what application development comes down to - in addition to reporting - see ctList below. Enhance presentations, application real estate and functionality with DBI's edit controls. Add Flexibility to your favorite IDE with the great presentation tools of Studio Controls COM 64. There are eleven general purpose components that will add to your own branding, User Interface design and enhanced functionality - saving countless hours of programming. Extend the Windows interface standards quickly and effortlessly using Studio Controls COM 64 - current Windows O/S certified and supported for great presentations and end-user navigation. From concept to implemented solution you need the right set of tools. DBI's presentation components are the perfect mix complementing the developers' toolbox. DBI's ActiveX products - Studio Controls for COM and Solutions Schedule for COM - ALL in one product offering, for one outstanding value! 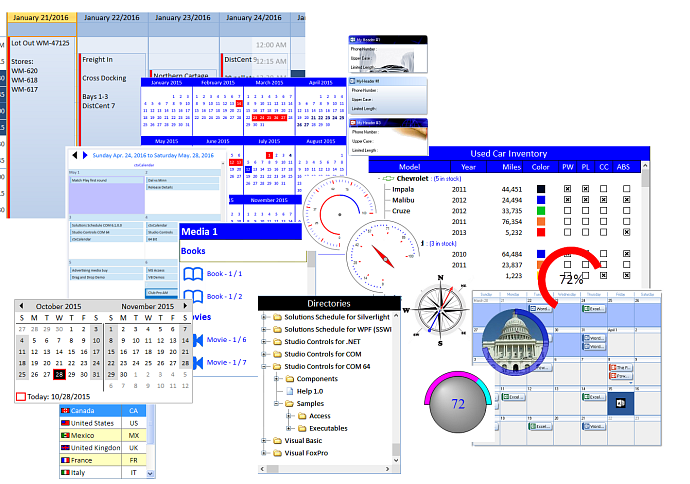 64 royalty free ActiveX controls for Enterprise resource planning, scheduling and UX design. A complete resource scheduling program tailored for scheduling (rostering, planning, forecasting, workforce management, crew assignment...) staff resources in any commercial environment. Staff Scheduler Pro has been enhanced to accommodate the hospitality and cruise industries with integration to multiple POS solutions including: Squirrel, Maitre'd and Mircros. Save yourself months of time managing schedules and have real-time analytical reporting with Staff Scheduler Pro! Analytical reporting includes: covers analysis, labor burden, revenue to labor cost analysis, historical staffing reports and many other standard reports to choose from. Put the right people in the right place at right time, today. Open the 'box' (in Visual Studio), select your data source and, using the integrated data mapping tool, sync your tables and click compile - you now have a full Warehouse Scheduling Application! The DBi Warehouse Shipments Scheduling Framework (WSF) is a .NET development Framework Solution designed for organisations looking for a trusted way to implement a standards-based Warehouse shipment and dock scheduling system. WSF incorporates DBi's award winning Solutions Schedule for .NET - Enterprise and Studio Controls for .NET component software along with WSF specific custom objects, Data binding, UI presentation, reporting and business rules. DBiWarehouse Shipment Scheduling Framework is a .NET Windows Forms development product ready for implementation in as little as six (6) lines of code, or ready for integration with enterprise systems including Microsoft Dynamics.